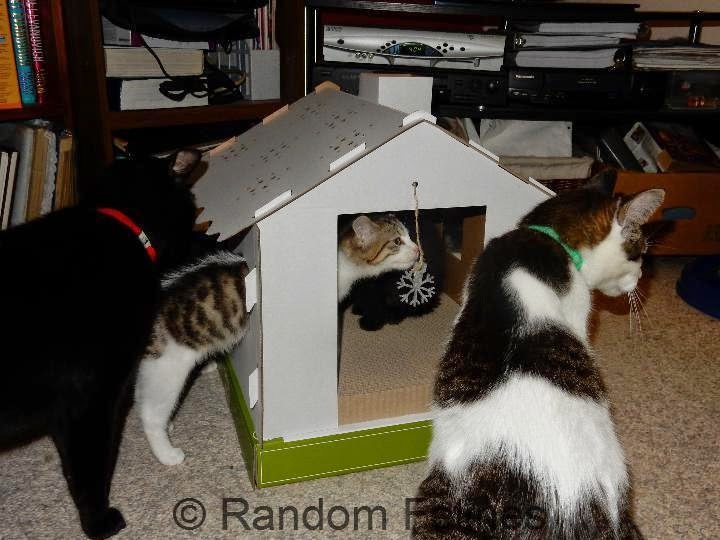 Last week mom saw a post from the Itty Bitty Kitty Committee about a gingerbread house available at Target (she tried to find a link and couldn't find it online). For $10 she decided she had to do it. 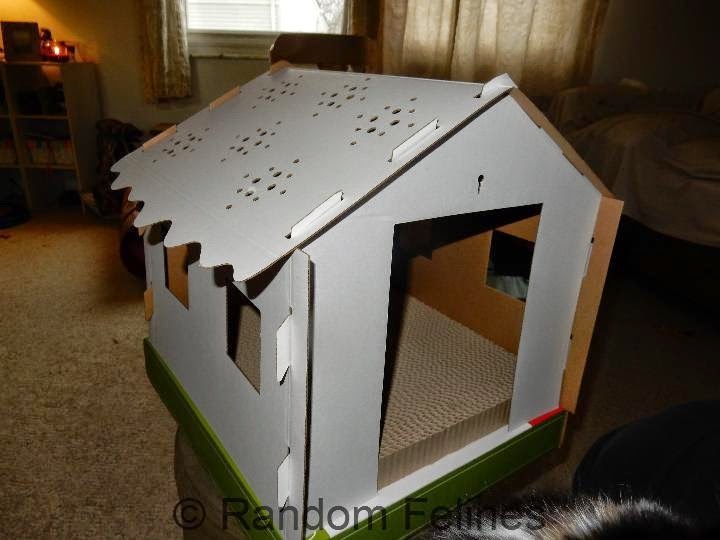 Well...it was easy to put together (though she suggests using some tape to reinforce the inside corners so that somecats don't wreck the house). So far everyone has checked it out. Daiquiri and the rest of the kittens like to go in and out of the windows. 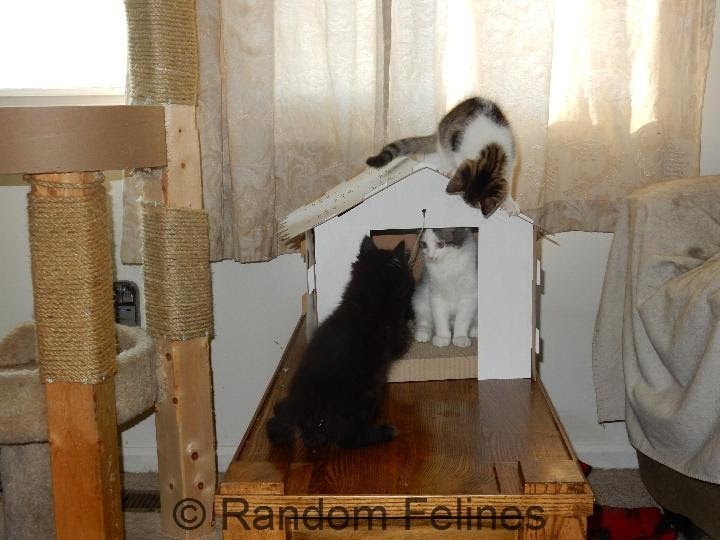 Some kittens have even tried to get in from above. Hey you guys - only Santa is supposed to climb down the chimney!!! That's an awesome house! I didn't think it was big enough for adult kitties when I saw it at Itty Bitty, but your kitties fit! 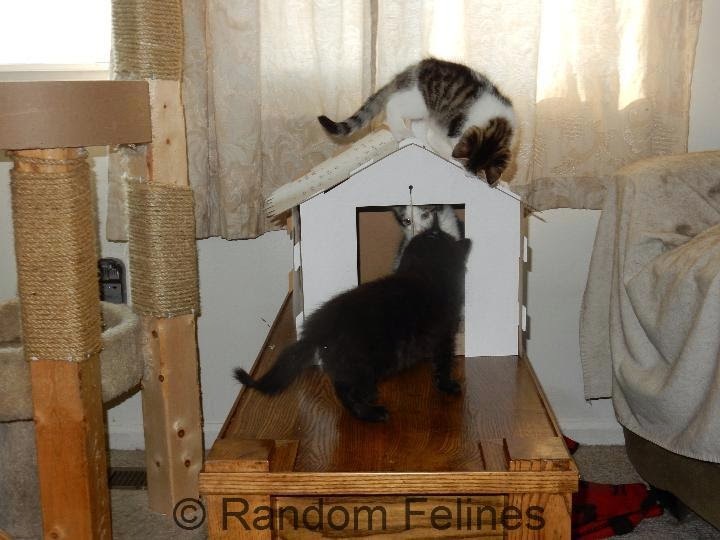 That does look like a lot of fun for the kittens and the adults too. Something new is always interesting. We think even our Mom might be able to put that together. Moving into a new house is always exciting. Obviously, some cats there like the neighbourhood. What a great house and it looks as though you'll all be piling in for your naps. That house is terrific, and we especially like those stickers, they're great. OMC! Think we need to send The Mom to Target to get us one too! Looks like a lot of fun! Looks like everybuddy loves the house, and who wouldn't. Now that is a super cool house and it didn't take long for the crowd to arrive! That house looks like loads of fun! Oh, I just LOVE that house! 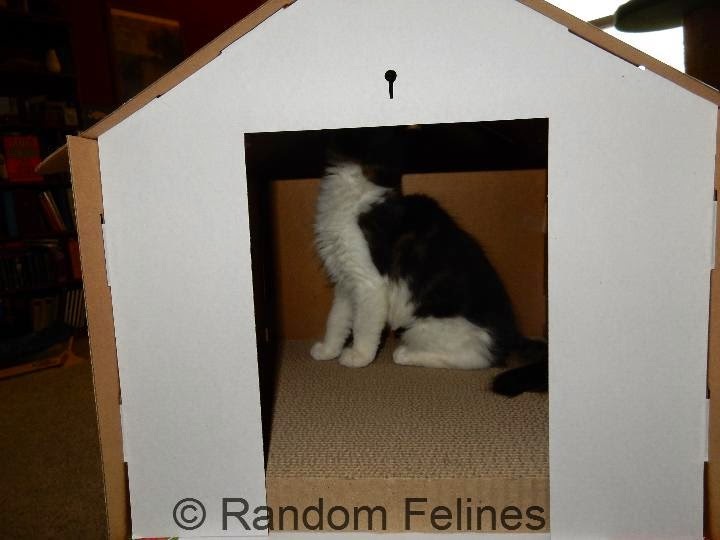 It's like a house and a box all in one! What could be better?!?! Would it hold up to a 38 pound puppy? I'm very tiny. I'll be right over! That looks like a fun house to play in. that is a cute house!! You can decorate it for the holidays! We love how you decorated the house! 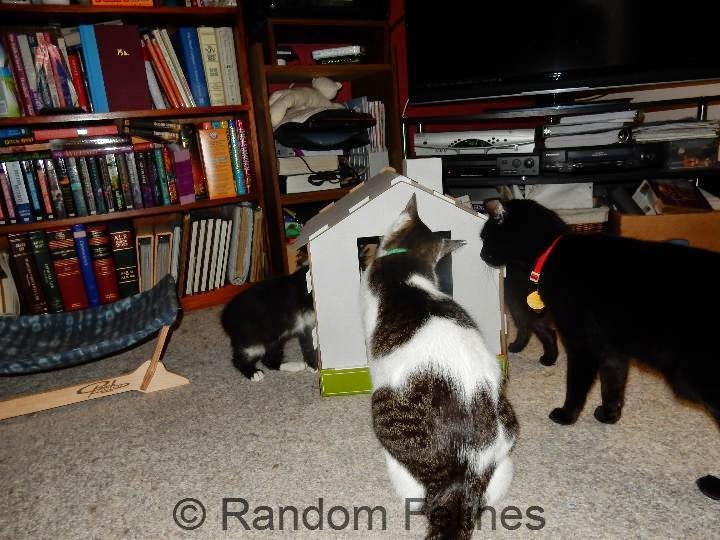 We love our house, and it absolutely fits grownup cats, though not necessarily at the same time, since we don't play well together. A house that's a box! SCORE!!! Have fun kitties! What a cool house! 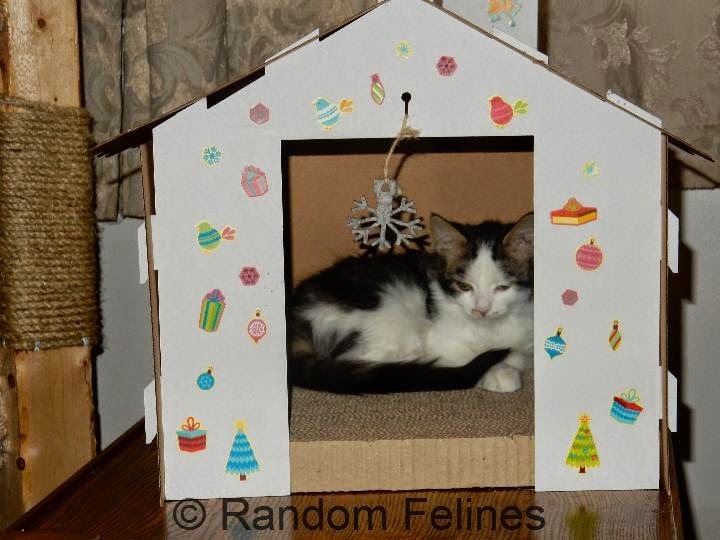 The kittens are gonna love it!